A huge thank you to all teachers, for your heart, devotion, and love for our children. As parents, we are so grateful for you, our words may not always fully express what we feel inside. We appreciate all that you do, often behind the scenes where no one even sees. Know that you are loved and valued by many. You are an amazing gift to our kids and to our families! God’s blessings over you, this new year ahead. We pray for your peace and covering over this day, and for the whole year ahead. We thank you in advance for all that you have in store and ask that you would unfold great blessings and gifts in the coming days, that this would be remembered as a year that God gave greatly. We ask for your wisdom and grace for each teacher as they prepare to lead their class each day. Equip them for every good work you have prepared ahead of time, we ask that your strength would fill them, that you would enable them to do all that they do with a heart of compassion and grace that comes straight from you. Give them ability and effectiveness as they teach, fill them with creativity and passion for this very important role that you have called them to. Give them laughter and fun in every day, but especially in the times when they get tired. And in the moments when they feel like there’s just not enough time to do all they need to do, multiply their hours, and give success to their efforts, for we know that you are able to do much more with a day than we ever could. Remind them that they have the incredible ability to make a difference in the life of a child. Every. Single. Day. And that what they do is so important, because they are a part of building greatness in our world, through the next generation. Give help when they’re weary, give grace when they feel they’ve reached the limit, give peace when they feel overwhelmed. Empower them by your Spirit with enough energy to match even the most active child in their class. Help them find strength in one another, reminding them that they are a team, and that there is greater power together, rather than alone, to face every struggle and obstacle that may come their way. Remind them, that more than representing a job, or a school, or a district, they represent you, and because of this, your spirit and covering are brought to school every day. And that is a very powerful thing. Give them a spirit of discernment for every child in their class, that they have the heart to understand each one of them more deeply, and see them as you see them. Give them a great ability to understand every parent represented too, reminding that you have destined every one of those paths to cross, and you have great purpose in it all. Give them a heart shield to block out any negativity, to see through the outside to the inner fears involved, to let go of what needs to fall away, and to hold on to what needs to be held on to. Give wisdom to embrace encouragement along the way and to give encouragement where it is needed. Instill in us all, teachers and parents, a heart of learning this year, because we’re never too old to learn new things. Give us all fresh perspective to see life through the eyes of a child, because sometimes important things become blurred and unclear as we grow up. Surround their families and personal lives in your care and protection, providing abundantly for every need that they have. Help them to release every concern and anxiety into your hand, believing that you are able – to do anything. Love through them, shine on them, pour out your blessing and favor over them, throughout the year. Thank you for reminding me of why I’m really in the teaching position I’m in-to glorify God and fulfill His call in my life. I’m in a hostile work environment-I’m disrespected for my faith, my age and my compassion! I was not a teacher, but I understand you frustration. I found that all you can do is carry on, be restrained in your behavior and know that there is light at the end of the tunnel. Be strong and still in your battle. Look for the small victories you have with your students as reward for now. Thank you! I teach at a Christian school. I am going to use your prayer and verse list for our morning devotions today. It is wonderful to know that parents pray for us,. 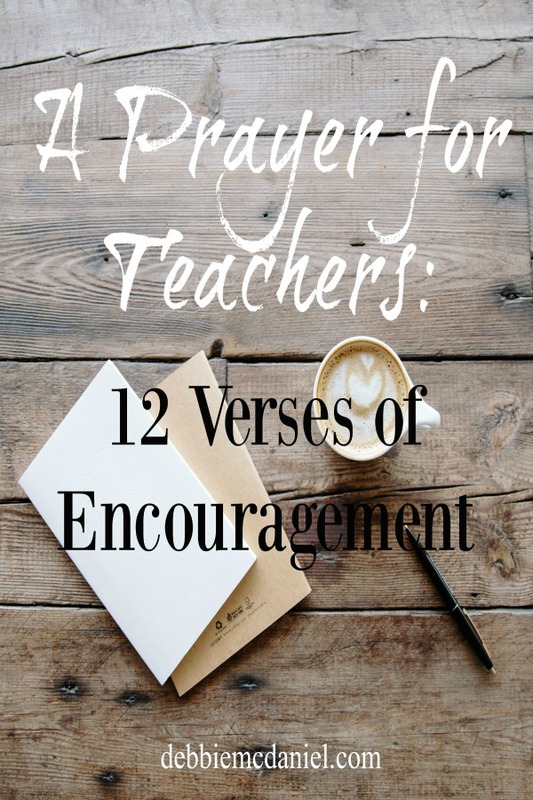 What a great way to be intentional with the power of prayer connection for our teachers and those they impact. Thank You, Debbie! Thanks so much Vicki, thankful for the power of prayer! This is such a great idea. Our teachers need our prayers. They have a big responsibility. Absolutely, so grateful for them & the impact they have in our lives!